As I’m sure you’ve figured out, this story is inspired by It’s a Wonderful Life (1946). But, unlike The Muppet Christmas Carol (which I also wrote about) or Muppet Treasure Island, it’s not a retelling of the story. 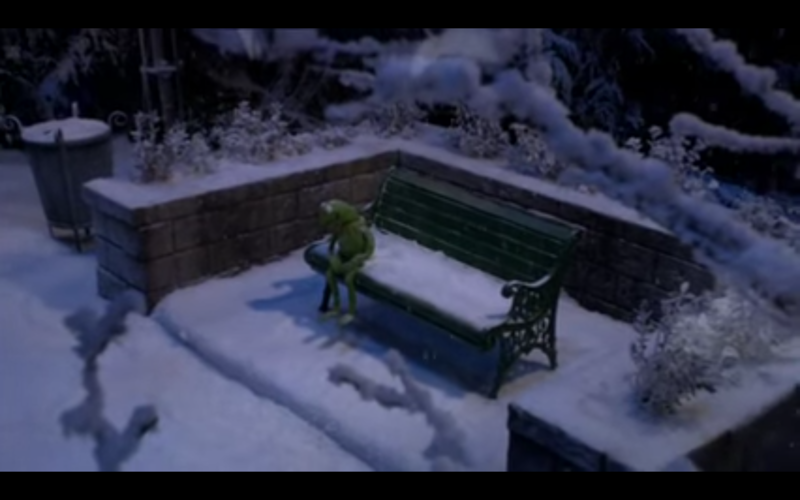 Kermit the Frog is not playing George Bailey: The Muppets are all playing themselves, and this is their story. Oddly enough, this film’s plot “bears” (Get it? “Bears”? Wocka wocka!) a striking resemblance to The Muppets (2011). A rich tycoon wants to tear down the Muppet Theater, and The Muppets have to put on a show to raise the money to save it. … And yes, I will be making more Fozzie-worthy puns in this post. Other than that basic plot point, though, the films are very different. Here, the fact that they don’t have the money to save the theater is a foregone conclusion, as it’s stated in the opening scene. Shortly after, the angel accountant Daniel (David Arquette) literally hits “rewind” to show God, a.k.a. “The Boss” (Whoopi Goldberg), as well as all of us, how The Muppets got to that point. Just don’t “freeze” it, Daniel, okay? The movie isn’t a full-blown musical, but we do get a couple musical scenes. One is fun medley from The Muppets’ Moulin Scrooge number, a spoof of Moulin Rouge! that’s even funnier if you’ve seen the source material, from the varying––– and constantly competing––– musical styles, to the camerawork, to the commentary on the original. Some people might say that Moulin Rouge! is too inappropriate for children for The Muppets to target with a spoof, but one of the––– admittedly many––– things I love about The Muppets is that they don’t have a chart-friendly target audience. Yes, little kids watch and love them, but so do older kids, and so do adults! People who love the mix of fun, satire, self-awareness, weirdness, and heart that The Muppets excel at aren’t confined to one specific age group. This scene in particular shows that The Muppets are excellent at doing a spot-on spoof that’s entertaining for all age groups––– though the older viewers who’ve seen the source will be laughing harder. Are there cameos, like in other Muppet productions? Of course, all over the film, and they’re hilarious. Some you’ll love, some you might not, depending on your personal taste. Moving on. 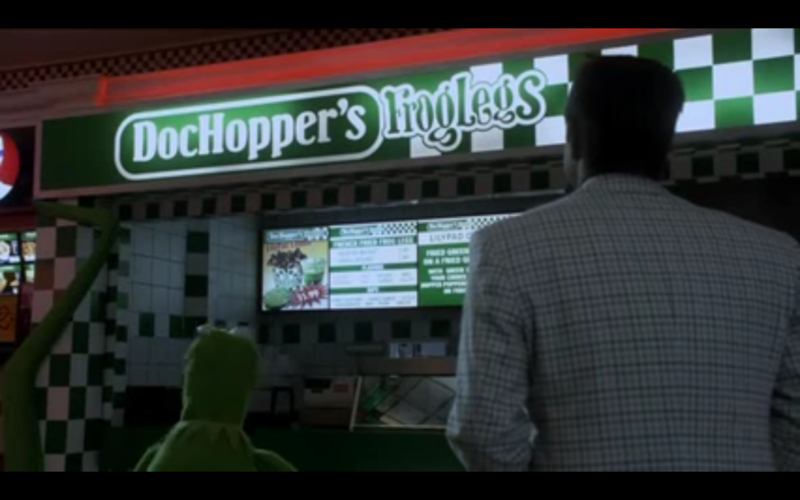 Speaking of addressing a wide range of viewers, this movie has some very heartfelt and clever references to The Muppet Movie. Again, audiences not familiar with The Muppet Movie will still feel the intended effect, though audiences who have seen it will feel it deeper. … Like a deep punch in the gut. In terms of non-Muppet costars, Joan Cusack is wonderful as Rachel Bitterman, CEO of Bitterman Bank and Development (BBAD). She’s exactly what her name says she is, and her quick temper and intense focus on only making more money at any cost (Ahhh! Wocka wocka!) make her very, very funny. Her interactions with Pepé as she manipulates him are fun to watch, and his eventual revenge is very satisfying. Whoopi Goldberg is also great as God, who definitely has a dry sense of humor and is wiser than she lets on. David Arquette does well as Daniel, the earnest, but bumbling angel who just wants to help, but is racing to learn the ropes as he goes along. 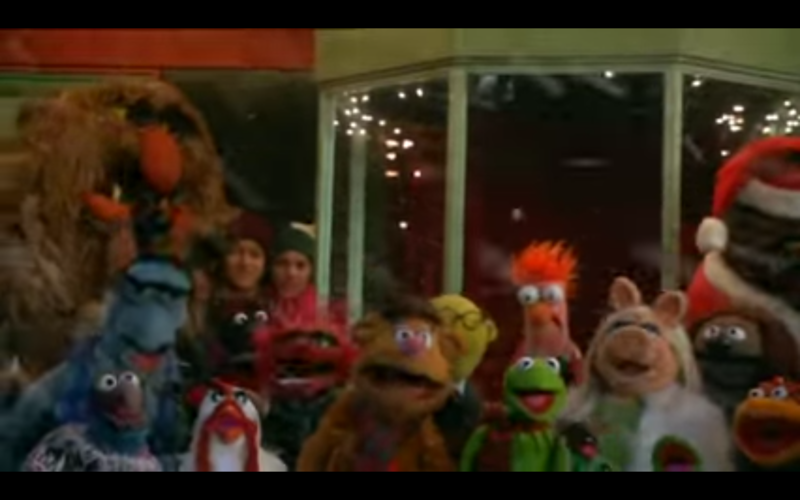 Another really fun aspect of It’s a Very Merry Muppet Christmas Movie is its many references to other famous Christmas movies. I won’t give them away here, but trust me, you’ll recognize them… a couple are even running gags! Is there Muppet wackiness and slapstick? The Muppets not being wacky?! When pigs… oh. 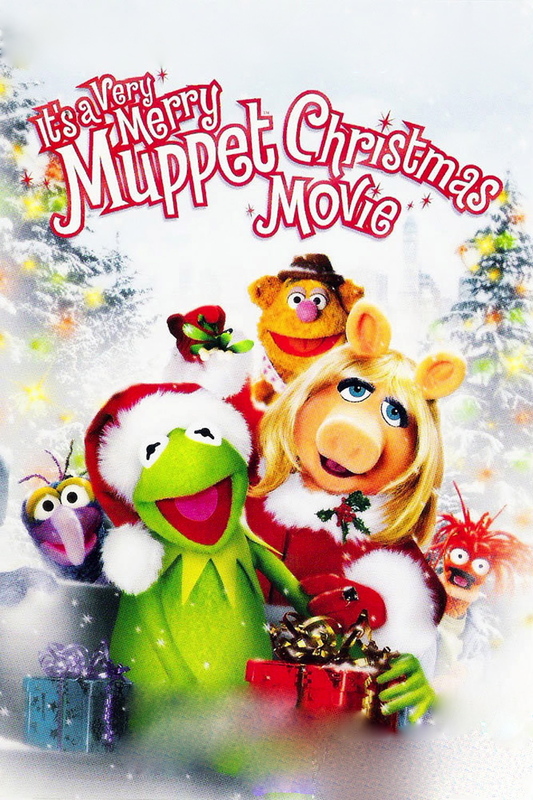 I have a very personal connection with It’s a Very Merry Muppet Christmas Movie. When I first heard the announcement that The Muppets (2011) had been green-lit (way back in 2008), I thought, Oh yeah: I remember The Muppets! They were pretty funny. I remembered really liking Gonzo because he’s “the weird one,” I remembered Kermit and Miss Piggy’s complicated relationship, I remembered the commercials for their movies and their guest appearances on shows like America’s Funniest Videos, and… that’s about it. I don’t know why, but I felt this pull to go back and watch more Muppet material: that there was something I was missing out on by not knowing these characters better. And boy, was I right. Among the first Muppet material I watched was the first season of The Muppet Show and It’s a Very Merry Muppet Christmas Movie. I guess I wanted to start at the beginning while also looking at some of their most recent work at the time. I soon learned that Gonzo was not just “the weird one,” but one of a whole crew of “weird ones”… and yet, he still stands out as “weird”! (Side note: as a “weird one” myself, I mean this as the highest of compliments.) I was sucked in by The Muppets’ unapologetic goofiness, sharp humor, satire, self-awareness, and nonexistent fourth wall. … And now that song’s in your head. You’re welcome! 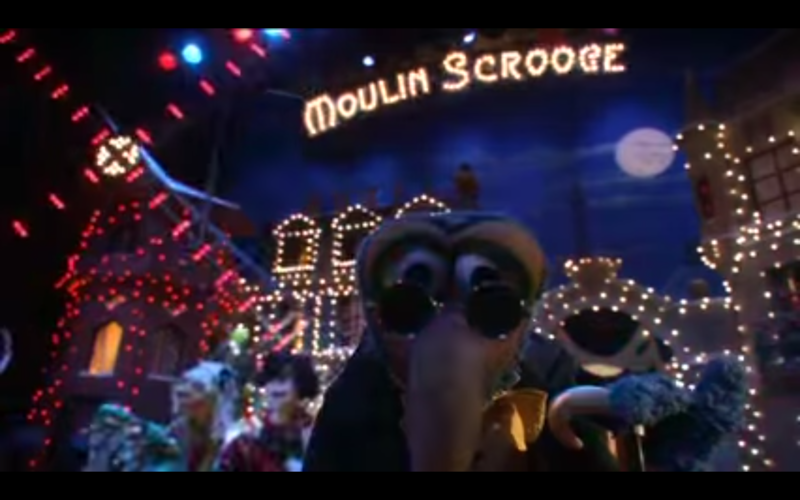 Outside of the aforementioned Moulin Scrooge number, we do get one more song: “Everyone Matters.” It starts off as a quiet, heartbreaking solo from Gonzo (with a slight dash of humor as he fully indulges in the line, “miserable, horrible, OBNOXIOUS, INTOLERABLE”). Then, Kermit the Frog joins in and lifts the mood of the now-duet, as he’s so good at doing. The song gets a triumphant group reprise at the end of the film that, in true Muppet fashion, demolishes the fourth wall. 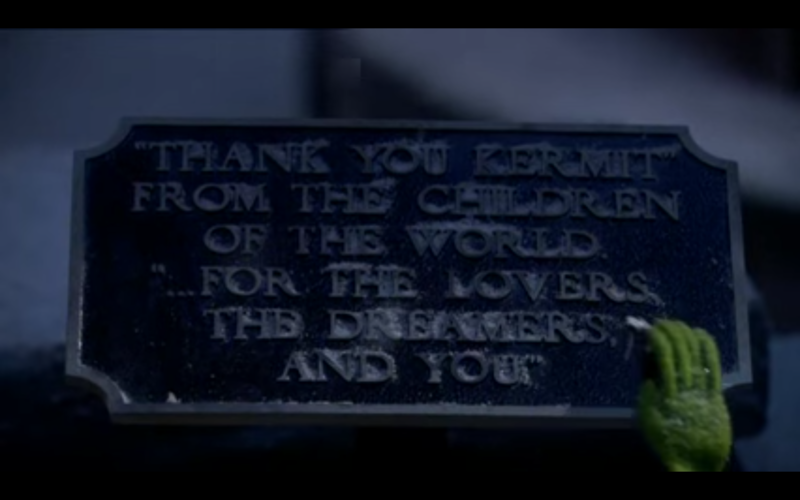 Maybe I’m incredibly biased because it’s a message I needed to hear at the time and wasn’t expecting to hear in a random Muppet movie I decided to watch, but “Everyone Matters” is not only beautiful and moving, it’s one of my favorite songs. Not just one of my favorite Muppet songs, or one of my favorite Christmas songs, but one of my favorite songs period. Yes, granted, that’s a sizeable list in my case, but it doesn’t change the fact that every time I hear “Everyone Matters,” it’s like I’m hearing it for the first time again. Except this time, I know the words, so I can sing along. Those chills aren’t from the winter weather, folks. Though this song resonated with me very deeply, I believe that it’s something we all need to be reminded of from time to time: you matter. Even if you feel like you’re all alone, your existence makes a difference. If you’d never been born, something would be different; if you disappeared, something would change. What you say and what you do matter, even if you can’t always see the impact. Let’s remember this, and start using our impact in a positive way. From someone’s who’s been on both sides, I can attest: just smiling and saying, “Hi,” to someone can leave an impact. How much do I love It’s a Very Merry Muppet Christmas Movie? Every December, I do a series of holiday/Christmas/winter songs on my radio show, Jammin’ with Jamie, and I always make sure “Everyone Matters” is included. When I play Muppet songs on Jammin’ with Jamie, “Everyone Matters” is always in the lineup. 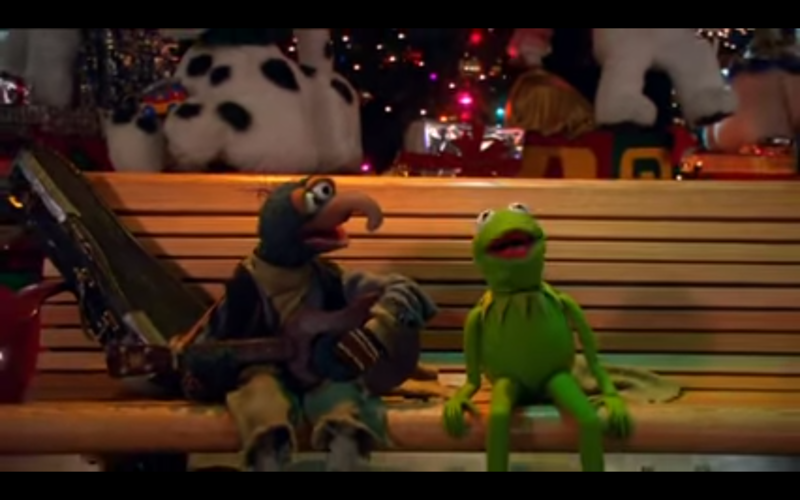 By the way, It’s a Very Merry Muppet Christmas Movie never had an official soundtrack released, so I had to edit the version I use on Jammin’ with Jamie, which includes the reprise, myself. (Don’t worry: I got all the footage from the DVD I bought!) That’s how much I love this movie and this song. … And a very merry song in your heart.